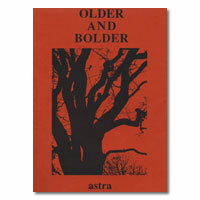 A book of poems by Astra. Produced under the Perspectives self-publishing scheme. This book is NOT available through Third Age Press. Orders for this book ( a limited number of copies left) should be addressed to Adam Blaug. Contact him via email: adamblaug@gmail.com or 07956 318964 for details. A donation of £12 to Astra’s chosen charity, Womankind, should be made, online, at: http://www.justgiving.com/astrablaug or by cheque to Adam Blaug (as above) .